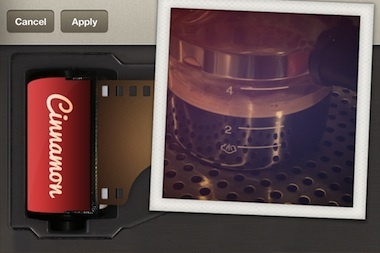 Create and Share moving GIFS on the iPhone – easy as 1, 2, 3, now with 2.5 option! There has been a few moving GIF apps for the iPhone. I have played with them but pushed them aside as they required the result be shared via their site or they put their logo on the end product. 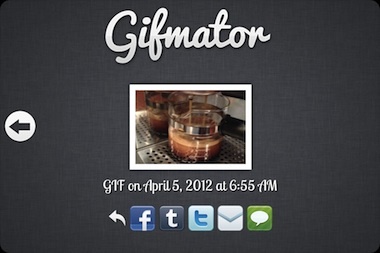 This morning I found Gifmator which is proving to be a bit of fun! The app has a rather extensive What a Moving GIF is and How-To book built in, handy if you want to jump right in then have a question. 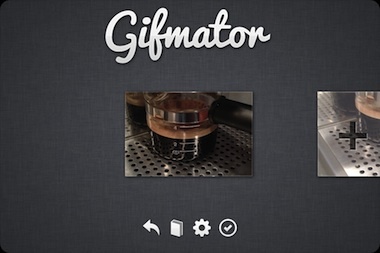 Gifmator allows you to build moving images, think of them as flip cards in a single image file, with 2 to 30 images. You can use photos or videos you take through the app or tap/hold on the ‘+’ to use images from your iPhone’s photo library. There is no re-ordering of the photos, cropping or sizing, but there is film and lens filters that you can apply to alter the images and impact of your GIF. This enhancement to the images is my ‘2.5’ step that other options do not provide. When you have the images as you like, tap the check and Gifmator assembles the images into a single GIF, ready for you to view, send via email or share through Facebook, Twitter, Tumblr or even attach to a text message. Your finished result can be as fun or serious as you make it. I’m thinking about all of the little stop-motion shorts that I can do.